Matrix opticare smoothing conditioner an effective treatment that restore and softens chemically straightened hair. Matrix Biolage Smoothproof Conditioner gets rid of frizz and excess volume with state-of-the-art formulas inspired by nature. Matrix opticare smoothing conditioner is enriched with shea butter that protects hair and moisturizes making the more healthy, silky and shiny. It detangles hair and detangles coarse, frizzy hair making them shiny and frizz free. 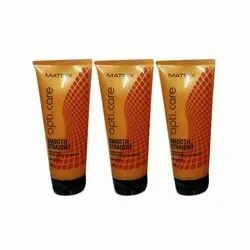 Matrix Biolage Deep Smoothing Conditioner is specially formulated to manage unruly hair. Biolage smooth therapie smoothes unruly, frizzy medium to coarse hair with silky serum of camellia. Serum-infused technology deeply moisturizes and helps control frizz through all seasons – even in97% humidity.